SHARON, Mass. – Sharon senior Ben Stamm scored once in each half and the Eagles’ defense was able to limit Franklin in a 2-0 win on Friday afternoon. The Eagles didn’t waste much time to seize the lead, finding the back of the net inside the opening five minutes. Sharon then iced the game with just over 10 minutes to play. Both goals came off long throw-ins. In the fourth minute, Shubojit Roy-Chowdhury launched a long throw from the attacking third into the area. The ball fell to Stamm, who had his first shot blocked. The senior kept with it and got another shot, this one was partially blocked but trickled in at the far post to put Sharon up 1-0. “We’ve been working on possession and switching the field a lot since the KP game,” Kelly said. “Some of the pieces fell into place today. Getting that early goal, just that little poke in, it gave us confidence to ride. We lost a little composure after that but I have a good group of seniors that can get it back for us. And I have a lot of subs at my disposal and we don’t get any worse. Franklin had the only other scoring chance of the first half. In the 16th minute, Matt Poirier launched a service from the right sideline, just a few steps over half. The ball was deflected and bounced through Sharon’s area and found Farley Asmath, but his bid went over the bar at the far post. Chances were aplenty in the second half, the first just two minutes into the stanza. Spencer Hall worked to get some space on the left sideline and hit a service to the back post. Oliver Hu elected to have a go on a one-time volley but his bid went high. In the 55th minute, the Panthers had a free kick from midfield that Asmath met with his head to flick on. Kevin Hall ran onto the ball at the back post but his touch went just over the bar. 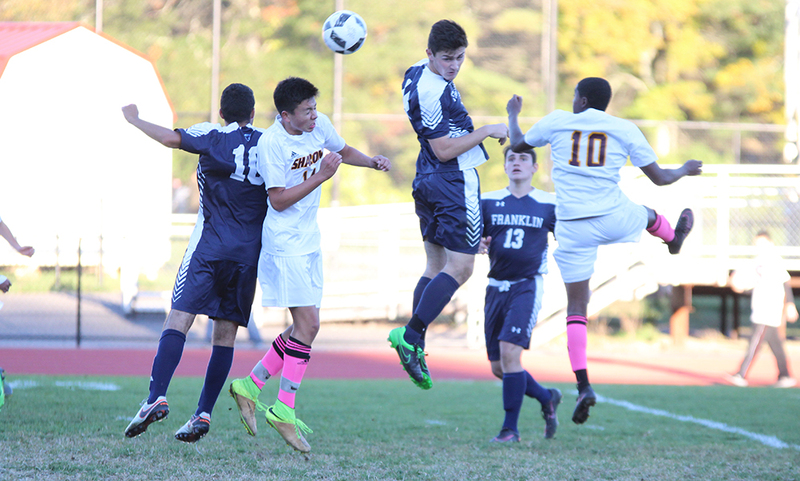 Two minutes later, Sharon had a chance when Alex Romantz flicked the ball to Andrew Reyes-Jones in the area but Franklin keeper Freddie Beckmann was first to the ball to end the chance. Ten minutes later, Sharon’s Marques Benton played a ball into Reyes-Jones but once again Beckmann was quick off his line to gobble the ball up. 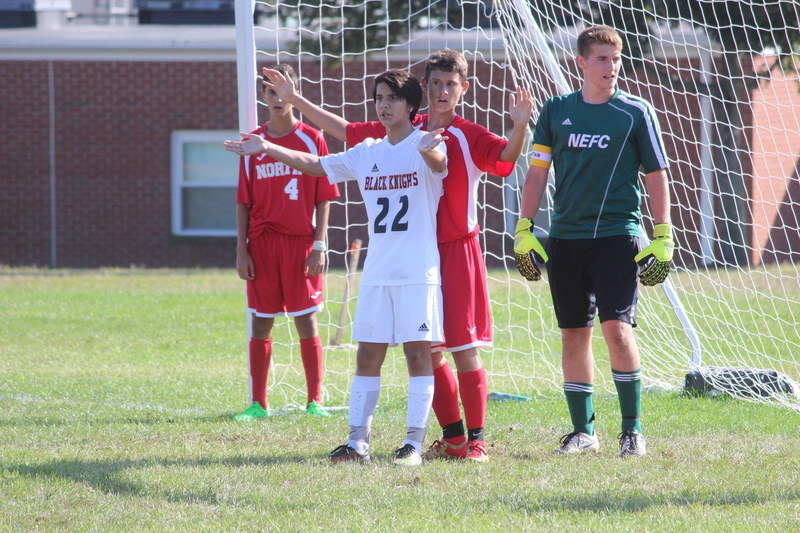 In the 68th minute, a free kick from Franklin’s Liam Kapples found the head of Hatim Brahimi in the area but Sharon keeper Ethan Kantor smothered the loose ball before a Panther could latch onto it. Finally in the 69th minute, the Eagles cashed in on another long throw. Tyler Hippler tossed the ball into the area and a scoffed clearance from the Panthers defense led to an open opportunity for Stamm and he buried it at the far post to make it 2-0. With the win, Sharon boys soccer (6-3-2) moves into a tie atop the Davenport division with Canton – both 5-3-2 in league play. The Eagles have three straight home games, starting with a visit from Foxboro on Monday. After picking up five wins in its first six games, Franklin (5-6-2, 4-5-2) has now gone winless in its last seven games. The Panthers will try to bounce back with a trip to Oliver Ames on Monday. NORTH EASTON, Mass. 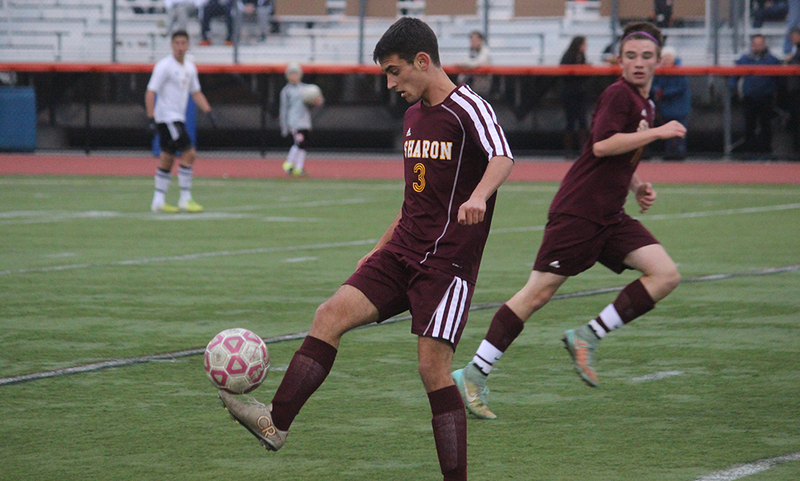 – Sharon’s Jake Goloboy scored with less than 10 minutes remaining on a counter attack and the Eagles picked up a point on the road with a 1-1 tie against Oliver Ames. The Tigers scored first, finding the back of the net in the 52nd minute to break open a scoreless stalemate but Sharon equalized in the 71st minute to earn the draw. Oliver Ames had the majority of the chances in both halves, including a volley from senior Chris Romero in the 13th minute that just went over the bar. Just a minute later, a long throw from Max Bamford was deflected around in the area but Sharon senior Matt Lowerre was in the right spot at the right time and cleared the ball off the goal line. The Tigers kept up the pressure and three minutes later senior captain Keegan Nutt got a hold of a shot off a bounce that forced Sharon senior goalie Andrew Filipkowski to punch the ball over the bar. In the 29th minute, Romero took a feed from senior Joe Cucinotta and ripped a low shot with his left foot that hit the near post and stayed out. Filipkowski came up big again with just over seven minutes left in the half when sophomore Nathaniel Cardoza had a chance from just inside the area but Sharon’s keeper got his legs in the way. “If we don’t finish, we’re not going anywhere. That’s just the fact,” Oliver Ames head coach John Barata said. ‘We totally dominated the game, they took two shots and scored one. That’s a problem for us. It was one counter attack all game. We hit the ball off the bar, we had chances inside the six, missed breakaways. It’s the same story, different night and tonight we got punished. The home side was finally able to convert just under 12 minutes into the second half. Sophomore Cam Vella hit a one time through ball to junior Thomas McCormick, who curved bent his run perfectly down the middle. McCormick unleashed a shot from a step inside the 18 but was robbed by a kick save from Filipkowski. The rebound fell to Nutt and he placed his shot off the far post and into the back of the net to go up 1-0. OA had another chance just over 10 minutes later but an acrobatic save from Filipkowski at the near post stuffed McCormick’s tough angle big. Finally in the 71st minute, Sharon was able to use a counter attack to catch Oliver Ames. 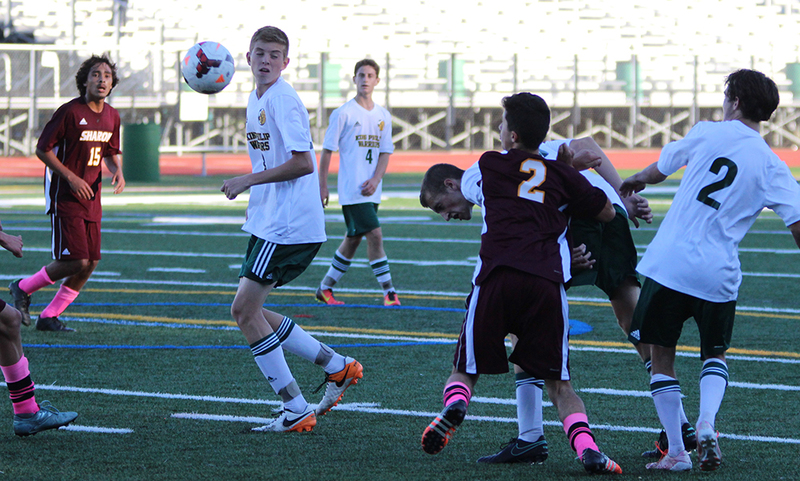 Senior James Dunlea unleashed a logn ball from midfield up to junior Oliver Hu. Hu pulled the defender to the right side and slid his pass into the middle to an open Jake Goloboy and the senior buried his chance into the back of the net. With just over five minutes to play, a deflected pass fell to Vella and he had a chance alone on Filipkowski but his low shot was swallowed up by Sharon’s captain. “In all honesty, that was one of the best performances I’ve seen from a high school goalkeeper,” Kelly said. “I think he’s the best keeper in the league. He’s the backbone of our team, he’s our captain, he’s our vocal leader and he’s why we are where we are in the season. Oliver Ames (12-0-2) remains unbeaten with two games left. The Tigers, who had a two point advantage in the Davenport Division race, travel to Milford and Foxboro next week. Sharon improves to 9-6-1 overall and will close out the regular season next week by hosting Foxboro and traveling to Canton. Sharon, 2 @ Norwood, 1 – Final – James Dunlea opened the scoring for Sharon off an assist from Lucas Allaria in the 57th minute. Less than 15 minutes later, the Eagles scored the game winning goal. Oliver Hu found the back of the net off an assist from Noah Kurland in the 70th minute. Oliver Ames, 3 @ Brockton, 2 – Final – With the game tied 2-2, Oliver Ames sophomore Jackie Mills netted the game winner off a great cross from junior Lauren Wright. Francesca Calabraro set up the Tigers on their first two goals. The first was to junior Tori Wyman in the first half to tie the game 1-1 and then the second was early in the second half to sophomore Abby Reardon. Attleboro, 3 @ Dartmouth, 2 – Final – Attleboro jumped out to a 2-1 lead at halftime and held on for a 3-2 non-league win over former conference rival Dartmouth. Grace Mayer, Ally Pierce and Katie Patton each scored once while Quincy Harding had two assists and Emily Houle had one. Franklin, 0 vs. Walpole, 2 – Final – Seniors Taylor Reutlinger and Maddie Gendreau and junior Dana Lewandowski played a strong game for Franklin according to head coach Lisa Cropper.